The year was 2005. Workers, digging up the road for Zeeland's East Main Avenue renovation, unearthed a stretch of trolley tracks from the old interurban line. 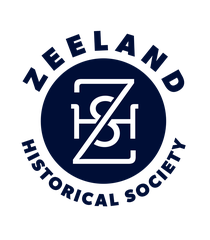 Thirty feet of track was donated to the Zeeland Historical Society. You can see two sections near the interurban station on the grounds of the Historical Museum. Some of the track was cut into small sections - a piece of Zeeland history. This is a rare and limited item that we are pleased to offer to the public. The track dates back to 1901. Each section of interurban track sports a copper-colored and numbered plaque. In the old days, most roads were unpaved and transportation was by horse-drawn carriages and carts. Then in the early 1900s, along came the interurban, a type of electric railway with streetcars that ran between cities and towns. The interurban that stopped at Zeeland was part of the Lake Michigan Railway line running from Grand Rapids to Holland. It allowed rural folks to easily travel many miles into a city or town for shopping and entertainment. By 1926, most interurbans were gone, the automobile and modern highways taking their place.